• The default "half-back" design provides full protection on the front (backrest, bolster, cushion part) while maintaining access to original pockets behind the backrest (if any) by covering only the top section behind the backrest. "Full-back" option means behind the backrest is full-length covered. "Map pockets" option means pockets can be added to both passenger and driver sides. • The default rear design allows for split-fold seats (i.e in separate covers), but normally covers up the armrest/cup holder (if any), making it inoperable. To access it, zipped armrest cut-out ($30 extra) can be made on request. The armrest itself is not covered in most models as the thickness of material would make a cover too bulky to push back into the recess in the seat. 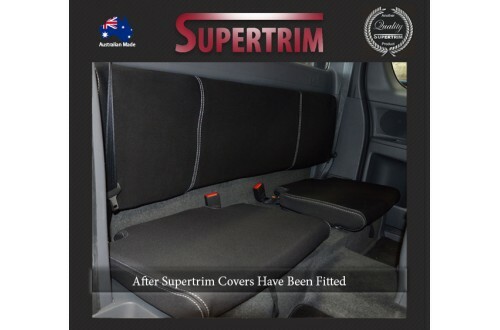 Our exclusive automotive-grade premium neoprene (wetsuit) material is used for manufacturing seat covers for car companies, importers dealerships in Australia. It is 2.4-2.5 mm thich, UV stabilized, fade and abrasion resistant. The top layer is synthetic fabric very comfy to sit on, the backing layer is of soft rubber that grips to the seat and will not slide around when sitting on it. Charcoal black fabric with default light grey stitching. Other stitching colour options cost extra.